July | 2013 | JUDDER! Hope you’re all well and enjoying the summer now its had the good grace to show itself! And what a way to see in the summer our VICTORIAN STEAMPUNK JUDDER was! We were concerned that the heat might have stopped people strapping themselves into their corsets and donning their top hats, but we needn’t have worried – there were some *spectacular* costumes and outfits in attendance! I’ve already put my photos on the Judder website gallery, and there are more to come – and remember, if you share your pics with us you can get on the guestlist for our next Judder! Oh and whilst I remember, *huge* thanks to Matt Clanky from Kenji Run for stepping in and guest DJ-ing for us at short notice – he did an amazing job and we’ll be seeing him again in 2014! So, looking forward, we’ve got not one, not two, but THREE chances for you to get on the Judder bus in August! 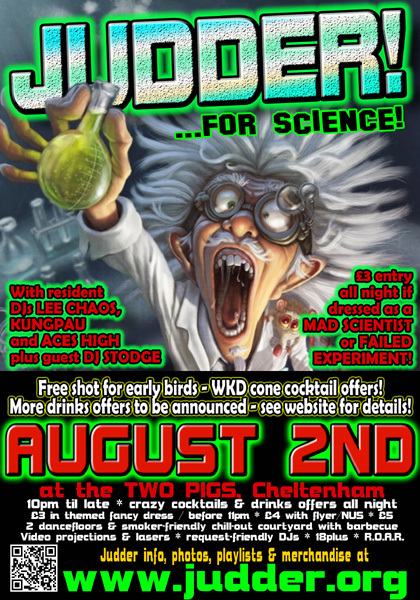 Firstly, Friday August 2nd is our JUDDER FOR SCIENCE!! with he return of popular guest DJ Stodge. We’ll be making sure there are plenty of things for you to experiment with, so dust off your lab coats – it’s reduced entry all night for mad scientists and any of their evil creations! Then, on Friday 16th August, we return to Cafe Rene in Gloucester for another night of Judder on tour mayhem – the last time we did this was one of the best party atmospheres I’ve experienced as a guest DJ, so I’m really looking forward to bringing the madness back to the depths of Gloucester! If that’s not enough for you (!!) then my electronic A/V band are also doing 2 gigs in August too – headlining SwanFest at the Swan in Cheltenham on Saturday 3rd August (yes, I *know* it’s the day after Judder..!) and performing a large-scale collaborative installation piece with performance artist Kate Spence at The Wig in Birmingham on Friday 23rd August. See www.temp0rary.com for details. Have a good summer and hope to see you for fun times soon!